Jack is looking dapper tonight! Disney Showcase statue spotlights Halloween Town's Jack Skellington. Inspired by The Nightmare Before Christmas. My, my, Jack. You sure look dapper tonight! 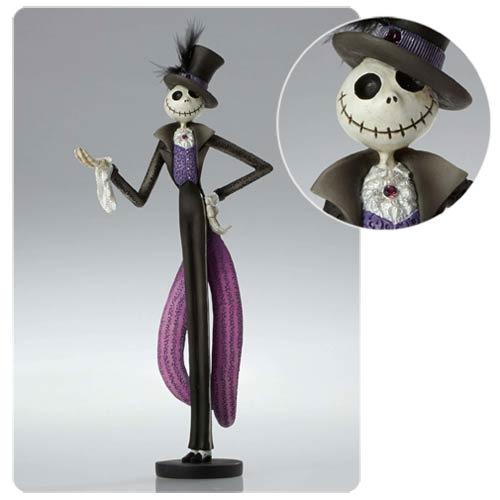 In his black top hat with feather, black coat with purple tails, and purple vest, Halloween Town's own Jack Skellington is ready for a night on the town - or even a wedding - as this exceptional Disney Showcase Nightmare Before Christmas Jack Skellington Statue. Won't Sally be impressed! The statue is fashioned of stone resin and measures about 9 3/4-inches tall. It's an excellent companion piece to the Disney Showcase Nightmare Before Christmas Sally Statue (sold separately). Ages 13 and up.